When considering the prospect of a long term archaeological project at the birthplace of Zeus on a remote mountaintop in the middle of Arcadia, Greece, Dr. David Romano, Karabots Professor of Greek Archaeology at the School of Anthropology, University of Arizona and Dr. Nicholas Stapp, Director for Geospatial Research at the Archaeological Mapping Lab, University of Arizona, were faced with serious communication challenges. The nearby village on Mt Lykaion, Ano Karyes, had one telephone for the standing population of 28. A weak cellular signal from Megalopolis provided some additional connectivity, and using this simple system of a phone chip that literally was hung in the window of the lab and swung with the breeze as their link to the outside world. The internet speed was both expensive and extremely slow, but it was useable much of the time and the base router actually functioned. But for the first time this past summer of 2016, high speed internet was available to the excavation at the site of the lower sanctuary and in the Cultural Center that is home to the lab in Ano Karyes. This was the result of a 7 year project of Dr. Stapp, working with Greg Palmer, then Executive Director of MAGPI, an Internet2 connector at the University of Pennsylvania, and who had originally facilitated the meeting with the Greek Research Network representative, Yannis Mitsos. 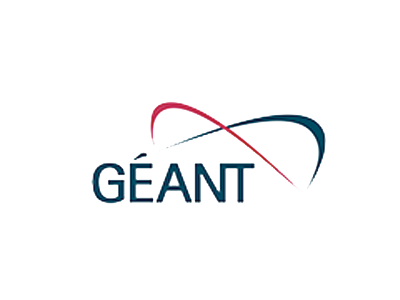 Planned for several years, the Greek Research and Technology Network (GRNET), with affiliations and connectivity with GÉANT, the pan-European network, was responsible for setting up a high-speed internet link from Tripolis at the University of the Peloponnesos to the site of the Sanctuary of Zeus at Mt. Lykaion. The end result was a microwave signal that originated in Tripolis and was beamed to a relay station on Mt. Doliana in the southeast Peloponnesos (12.7 miles) and then redirected to the Sanctuary of Zeus across the Peloponnesos (27.4 miles). The total length of the relay was 40.1 miles! 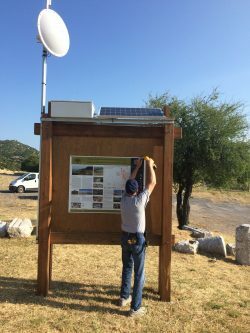 The microwave receiver at the archeological site was placed on top of their wooden kiosk at the hippodrome and powered by several solar panels. Combined with tablets for each trench in the excavation, students and researchers now have eduroam access to an 80 Mbps link to the outside world with both IPv4 and IPv6 address space. In addition to real-time access to analysis sites direct from the excavation site and scholars around the world, this joint initiative between researchers in remote field operations and the academic networks in Greece, Europe, and the U.S. represents a milestone in technological collaboration for the Humanities. The Mt. Lykaion Excavation and Survey Project is a collaboration between the University of Arizona together with, and under the direction of, the Ephorate of Arcadian Antiquities in Tripolis, and under the auspices of the American School of Classical Studies at Athens. The Co-Directors of the project are David Gilman Romano, Mary E. Voyatzis and Anna Karapanagiotou.